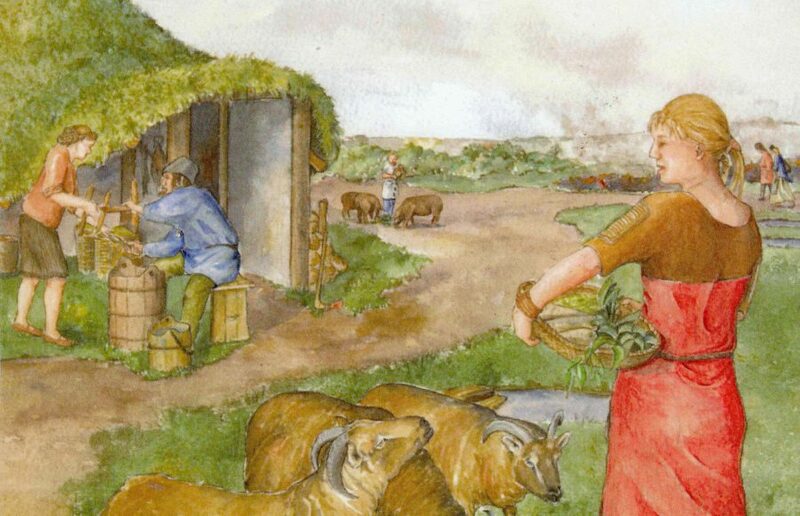 Before the Roman villa was built, the site was home to a family of wealthy Iron Age farmers. 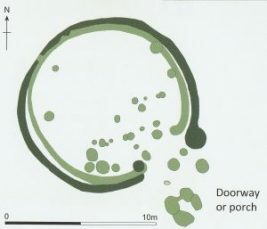 Traces of their roundhouses were found during both excavations between Itter Crescent and Fane Road in Peterborough. 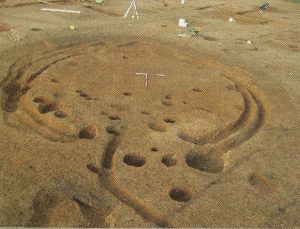 They were located within a D-shaped ditched enclosure the size of a football pitch. 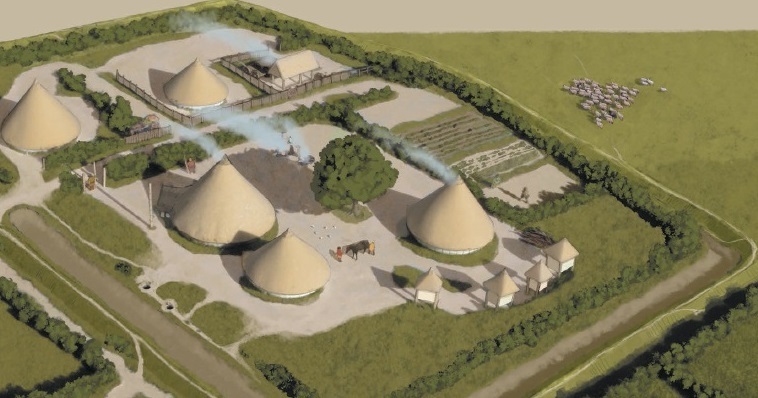 The plan shows the largest roundhouse found in the first excavation. The twin drip gullies indicate it was re-built at least once. Like many similar Iron Age buildings, the entrance faced southwards allowing as much light as possible to enter the dwelling. The thatched or turfed roof would have been supported by an ash/oak frame. The walls would have consisted of a simple wattle frame plastered with daub (mud, clay and animal dung) and then painted. An Iron Age family would sleep, eat, work and entertain in their small home. Bones found during the Community Excavation give clues about which animals the inhabitants were rearing or hunting. The animal bones found came from cattle, sheep/goats, horses, pigs, chickens and geese. As well as providing meat, fat, leather, wool and milk, the larger animals such as cattle and possibly horses would have pulled ploughs and carts. The chickens and geese would have produced eggs and feathers. The original dig also found bones of roe deer and a dog (perhaps used for hunting). Bones were also made into tools or used as jewellery. A bone awl (for boring holes in leather) and a dog tooth with a hole drilled through it (possibly worn as an amulet) were both found during the Community Excavation. 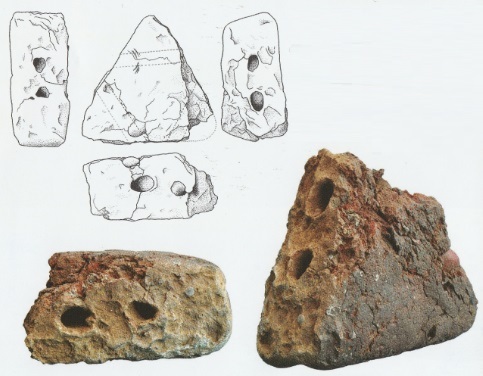 Fragments of 10 loom weights were found close to Iron Age pottery sherds. These finds tell us that people in the farmstead wove their own clothes of wool using a simple loom like the one in the reconstruction. 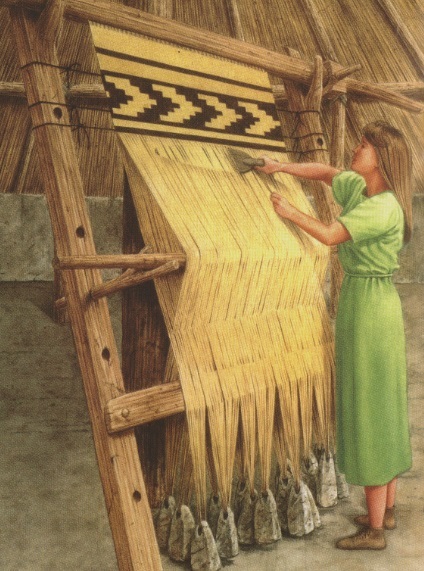 Before the cloth was woven it would have been dyed bright colours using local plants such as woad (blue), weld (bright yellow) and madder (red).